A Tony Awards celebration isn’t complete without themed eats, and we know just the guy to add pizzazz to your pastries. Broadway.com is teaming up with David Burke Group’s executive pastry chef and theater enthusiast Zac Young, who is sharing four decadent confections inspired by Tony-nominated productions. While cooking up a storm at Burke's midtown hotspot fabrick, Young discussed his ride from show tunes to sweets, with stops at Radio City and the Cooking Channel along the way. Check out the dazzling desserts below, print the recipes and get cooking! Prior to culinary school, Young trained at Boston Conservatory and worked in the wig department at Radio City Music Hall. It was there that he picked up a cookie-baking habit, which led to his sweet career change. 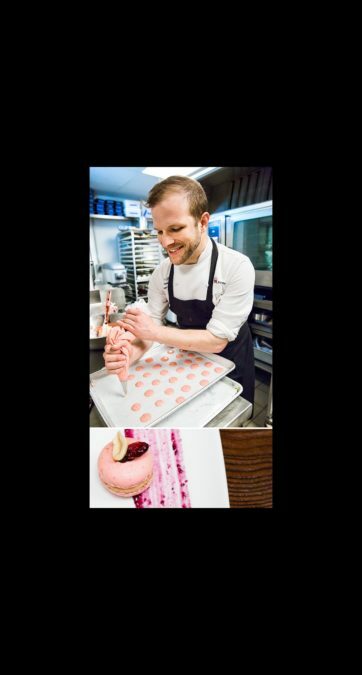 “Pastry was perfect,” he says, “because I was really good at science and had the flair for the dramatic.” Young loves Broadway, and Broadway truly loves him back. He created a donut tower—an alternative to a wedding cake—for Audra McDonald and Will Swenson, and his appearances on Top Chef: Just Desserts and Unique Sweets have made him a familiar face. His friendship with Keala Settle blossomed when she recognized him in an elevator: “I didn’t know if I should say something, but she turns around and goes, ‘We need to talk because I’m obsessed with you. '” Belting and baking: they go hand in hand.